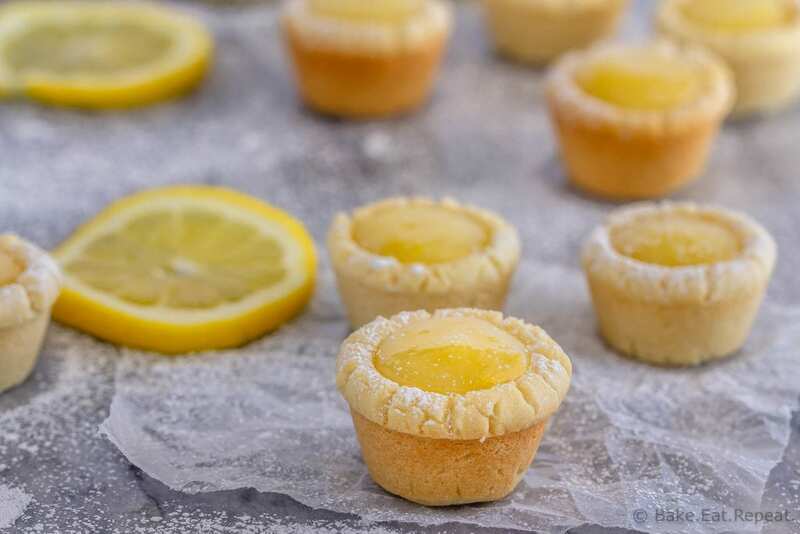 These lemon sugar cookie cups are like mini lemon pies with a sugar cookie crust – easy to make, they’re the perfect little sweet treat! Have you ever made lemon curd before? I have to admit that I never had, except for the kind that you make for a lemon meringue pie I suppose, although it’s a little different. But I recently discovered how easy it is to make homemade lemon curd – both on the stovetop and in the Instant Pot – and now I’m wondering why on earth I’ve taken so long to start making it. My freezer is currently filled with jars of homemade lemon curd, so I’m using it in everything I can think of. 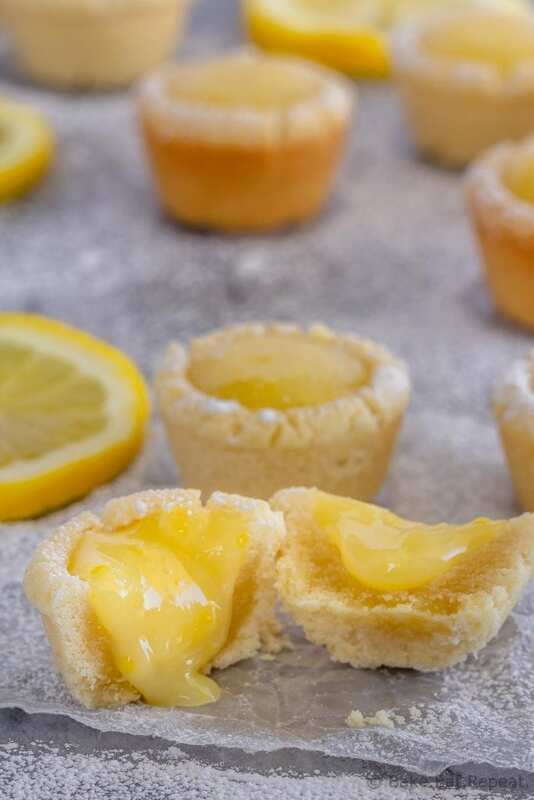 These lemon sugar cookie cups are one of our favourite ways to enjoy it so far. 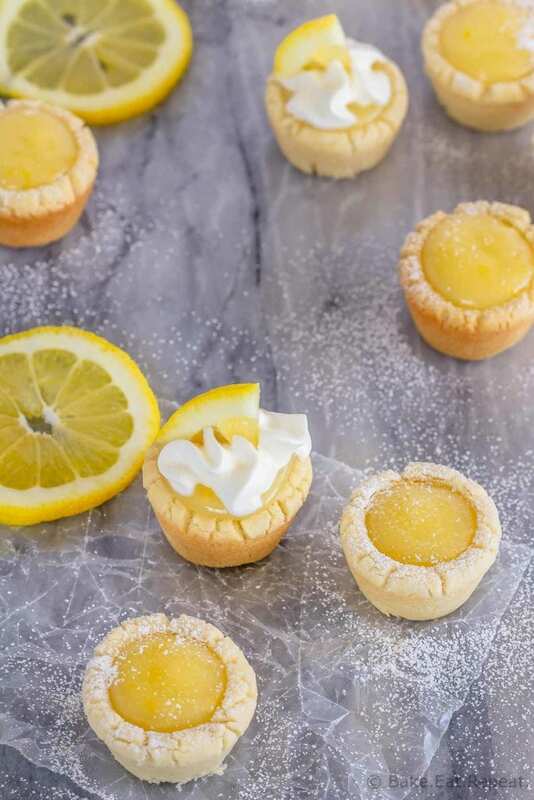 They’re like mini lemon tarts with sugar cookie crusts – so tasty and so easy to make. We all loved these little lemon sugar cookie cups. 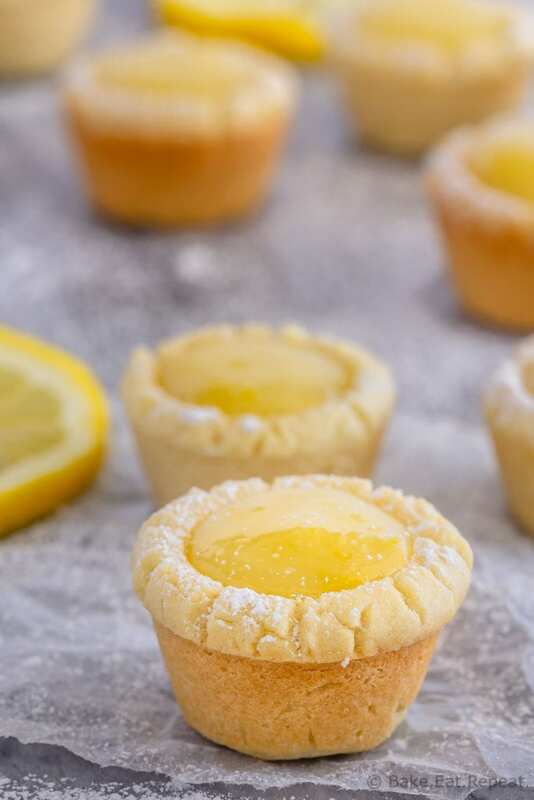 These are made with homemade Swig sugar cookie dough, baked in a mini muffin tin so the cookies are cup shaped, and then filled with this easy homemade lemon curd. But then, I love any kind of lemon treat. It’s just such a fresh and bright flavour, that it’s hard to find a lemon recipe that I don’t like. Although I don’t think that I’m alone on that! Desserts like these raspberry lemon cookies, these raspberry lemon blondies, or these lemon berry no bake cheesecake cups. Or even entrees like this honey lemon baked salmon or this one pot lemon thyme chicken and rice. All delicious. Lemon things are amazing. And these lemon sugar cookie cups are no exception. A tasty sugar cookie filled with a tart and sweet lemon curd – pretty sure they need to be made again soon! How do you make sugar cookie cups? Super easy to do. I use my Swig sugar cookie dough for these sugar cookie cups. Mix up the dough and place 1 inch balls into a greased mini muffin tin. Then use the rounded bottom of a measuring spoon to press a well into each cookie. Bake, re-press the well, and let them cool. Then fill those tasty sugar cookie cups with whatever filling you like. Lemon curd is pretty fantastic! What kind of butter do you use in sugar cookies? I always bake with unsalted butter. This makes it easier to manage the salt content in the recipe. If you prefer salted butter I would recommend reducing the added salt in the recipe to 1/4 teaspoon. There is approximately 1/4 teaspoon of salt in half a cup of salted butter. Make sure not to pull these sugar cookie cups out of the oven too soon – usually I say not to over bake, but if these aren’t starting to brown on the edges they will be very difficult to get out of the muffin tin without breaking them. They should be just starting to brown on the edges, and then they will pop out easily once they’ve cooled. If you don’t want to make lemon curd, you can use any store bought variety, but it is very easy to make if you want to try it! I’ve also shared this Lemon Sugar Cookie Cups recipe over on Food Fanatic. I can't say how they would turn out with almond flour as I've never tried that, and don't have any experience baking with almond flour. If you decide to try it, let me know how they turn out! Love this idea of cookie cups! They are currently in the oven! Thank you for your creativity!